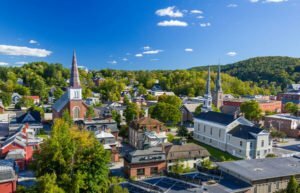 Montpelier ~ Vermont State Curator David Schütz will explore Montpelier’s rich architectural history in a talk at Kellogg-Hubbard Library in Montpelier on May 1 at 7:00 p.m. His talk, “The Architecture of Montpelier,” is part of the Vermont Humanities Council’s First Wednesdays lecture series and is free and open to the public. On Saturday, May 4, Schütz will follow up his lecture with a guided walking tour of Montpelier, meeting at the library at 10:00 am. Schütz has served as Vermont’s State Curator since 1986, overseeing the restoration of the State House over the course of nearly three decades. In that capacity, he worked with Nancy Price Graff to write Intimate Grandeur: Vermont’s State House, and he continues to interpret the building to a large, diverse audience with a renewed focus on civics, and a new exhibit installation celebrating Vermont’s indigenous people, the Abenakis. He has long been a student of Montpelier’s architectural history. The Vermont Humanities Council’s First Wednesdays series is held on the first Wednesday of every month from October through May in nine communities statewide, featuring speakers of national and regional renown. Talks in Montpelier are held at Kellogg-Hubbard Library unless otherwise noted. All First Wednesdays talks are free and open to the public. See the full schedule of Montpelier First Wednesdays talks. “The Architecture of Montpelier” is underwritten by the Margot George Fund.